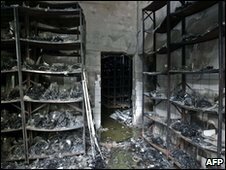 A leading collection of dead snakes, spiders and scorpions housed at a research centre in Sao Paulo, Brazil, has been destroyed by fire. The curator of the Butantan Institute said the destruction of the entire collection was a "loss to humanity". The nearly 80,000 preserved snakes and the thousands of specimens of spiders and scorpions were used in research. Live animals housed nearby that are used to produce serums and vaccines were not harmed, the institute said. A firefighter said the flammable liquid used to preserve the specimens helped spread the fire. Some of the specimens in the 100-year-old collection were of rare or extinct species.